Rheumatoid arthritis (RA) affects all ethnic groups. Women are nearly three times more likely than men to develop the disease. The pattern of arthritis typically favors distal and symmetrical involvement. The most commonly involved joints are the wrists, metacarpophalangeal, proximal interphalangeal, and metatarsophalangeal joints. However, many other joints can also be involved. Shoulder, elbow, hip, knee, or neck disease (particularly at the atlanto-axial joint, C1–C2) are frequently observed. Most presentations are subacute in nature, with the insidious onset of fatigue, morning stiffness, and arthritis. More explosive onsets of disease are also described. If untreated, RA is a chronic, progressive disorder that leads to joint damage, disability, and early mortality. A variety of extraarticular features are typical of “seropositive” RA (RA associated with the presence of rheumatoid factor in the serum). These include rheumatoid nodules, secondary Sjögren's syndrome, interstitial lung disease, scleritis, and rheumatoid vasculitis. Approximately 70% of patients with RA are rheumatoid factor positive. An approximately equal percentage has antibodies directed against cyclic citrullinated peptides (i.e., anti-CCP antibodies). There is substantial but not complete overlap between groups of patients who are rheumatoid factor positive and those who have anti-CCP antibodies. 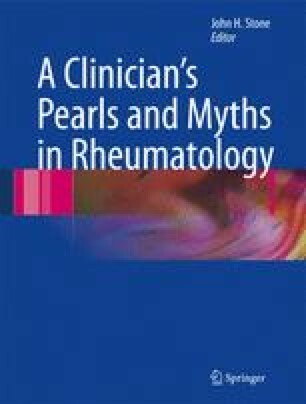 Some patients have RA that appears in every way to be typical disease yet do not have either rheumatoid factor or anti-CCP antibodies. These patients are said to have “seronegative RA.” Radiographic studies in RA reveal joint space narrowing, erosions, deformities, and periarticular osteopenia. Treatment approaches now emphasize early interventions designed to suppress joint inflammation entirely as soon as possible after the onset of clinical disease.